HARWICH — (USA) Tom Leach wears many hats: Top cop for the town’s waterways as harbormaster; expert on all things wild as natural resources director; and in a hobbyist role, an avid astronomer. But now, he’s found a new calling to build something unlike anything else in town. A monument of sorts, made out of huge pieces of granite. Leach wants to construct a version of the world famous Stonehenge, right in Harwich. 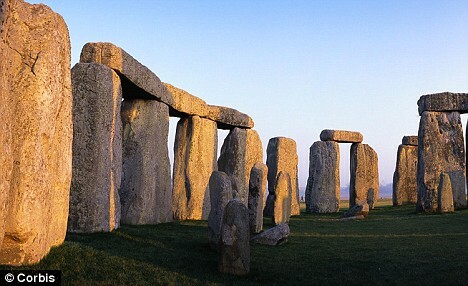 Stonehenge, near Amesbury, England, is a famous circle of standing stones erected around 2,500 B.C. World renown, this ancient site is both intriguing and mysterious, especially since no one has ever really figured out why it was originally built. Was it a burial ground? A marketplace? A temple for druid practices? Many have concluded that its main purpose was as a calendar of sorts, to track the sun, planets and stars. The idea of building a modern Stonehenge hit Leach as he sat in the back of a selectmen’s meeting a few years ago. The board was discussing whether to give the town of Wellfleet up to 90 large granite stones, some up to 9 feet tall and 3 feet wide, once used in a now-dismantled railroad bridge off Old Main Street. The board knew the granite stones were valuable and decided against giving them away. But the idea has not taken hold – yet. Leach knows the project requires a moderate sized group of volunteers and advocates. The layout and design must be drawn up and a proposal must be drafted for the conservation commission, which oversees the land on Thompson’s Field, to review. 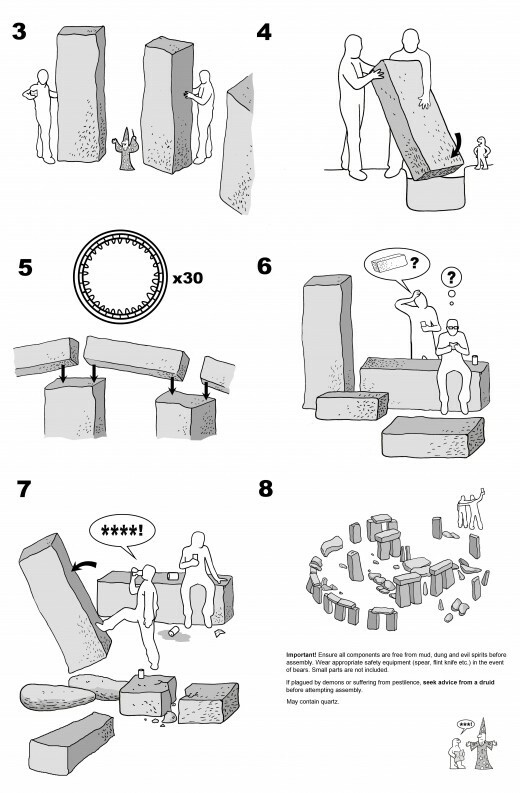 Then comes the sheer logistics of moving the stones and positioning them at whatever site is chosen. Lach said that he needs to see a more refined plan before the trust takes a position. He noted that a solar calendar on Wing Island in Brewster, built in the 1980s, has recently been maintained through a collaborative effort between the town and Cape Cod Museum of Natural History. “That’s something to study as an example,” he added. 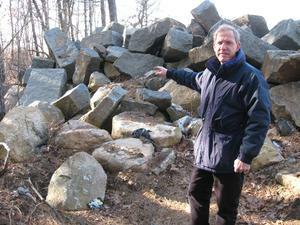 Highway department director Link Hooper noted that in 1999, the stones would have been buried as part of the landfill-capping project. “I personally went and got the material and dug it up with heavy equipment before it was capped. It took a couple of days to put them off to the edge of the landfill,” said Hooper. When asked about the idea of using the granite to build a small version of Stonehenge, Hooper didn’t want to take a position but said it was possible. Selectman Ed McManus said that several of the stones have been used for markers across town. For now, Leach is still hoping to pull together a bigger band of volunteers to help launch the project. “We have the land, we have the material, we just need the manpower,” he said. A building whose foundations were unearthed during an excavation at Marden Henge near Devizes last summer could have been a Neolithic sauna. Archaeologist Jim Leary told his audience at Devizes town hall on Saturday that the chalk foundations contained a sunken hearth that would have given out intense heat. Also found was a midden or rubbish heap with dozens of pig bones, some still attached, likely to be the remains of a huge feast that took place 5,000 years ago. Mr Leary was supposed to give his talk at the museum, but such was the interest in his subject that it was transferred to the town hall. All 150 tickets were sold and people queued for returns. Mr Leary said Marden Henge is the biggest henge in England but because it did not have a stone circle associated with it, tended to be overlooked. Before Professor Geoffrey Wainwright examined its northern sector in 1969, it had not been investigated since the early 19th century. A huge mound, like a smaller version of Silbury Hill, named Hatfield Barrow, once existed there, but it collapsed after a shaft was dug through its centre and was levelled shortly afterwards. The English Heritage team investigated that area as well as two sites further south, and it was at the area known as the Southern Circle that they made their most exciting discoveries. It was in the bank of this henge within a henge that they found the chalk floor. Mr Leary described the dig as a work in progress. He said: “We are at a very early stage and there is a lot more to be found. But our fate is in the hands of the government cuts. 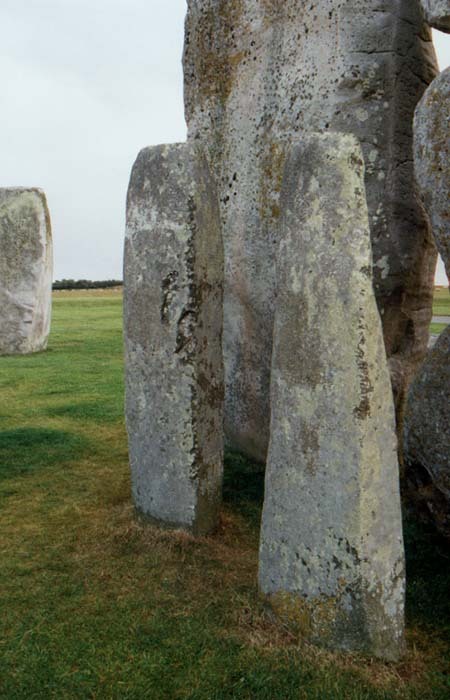 I ofter talk about the ‘Amesury Archer’ on my Stonehenge tours and wanted to put some facts into my blog for those visitors who keep asking for more information. An excavation in Wiltshire some years ago revealed the grave of a Bronze Age archer, buried with a rich array of precious metal goods and a quiver of arrows. Was this the King of Stonehenge? In the spring of 2002 what started as a routine excavation was undertaken in advance of the building of a new school at Amesbury in Wiltshire. By the end of the excavation the richest Bronze Age burial yet found in Britain had been discovered. 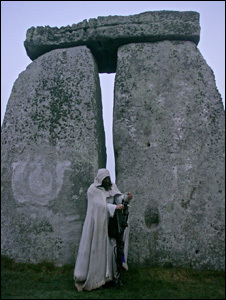 The Bronze Age man discovered there had been buried not far from the great temple of Stonehenge. He was a man who owned and could work the new and magical metals of gold and copper. And he had come from what is now central Europe, perhaps around the Alps. Was he a king of Stonehenge? Early Bronze Age pottery showed that they were over 2,500 years older than the Roman graves. On the site of the proposed new school there was a small Roman cemetery but, it seemed, little else. In the far corner of the site, though, there were two features that looked different. Had they been caused by trees being blown over? Or were they something else? They certainly did not look like Roman graves. Excavation work started on a Friday morning, and the reason for the difference between the Roman graves and the two other features rapidly became clear. The features were indeed graves, but the Early Bronze Age pottery in one of them showed that they were over 2,500 years older than the Roman graves. And the grave with the pottery was unusually large. 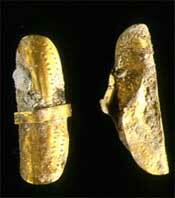 These golden artefacts may have been earrings or hair tresses . One of the next finds revealed something unusual – a gold ‘earring’. This type of jewellery may be the oldest type of gold object made in Britain. These objects are very rare, and they usually occur in pairs, and as it was the Friday of the May Bank Holiday weekend it was decided that the excavation of the grave should be completed that day. This might involve staying on a little bit late on a Friday afternoon, but not, it was thought, very late. What no one knew then was that the grave, the burial of the Amesbury Archer as he has come to be known, was to be the most well-furnished Early Bronze Age burial ever seen in Britain. The graves could not be left unprotected, so a ‘little bit’ late turned into ‘very, very’ late, as it became clear that this was a very important find. 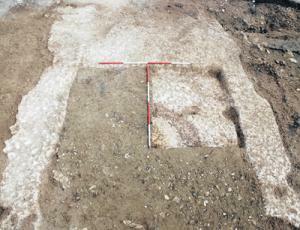 The excavation showed that there was probably a timber mortuary building in the larger grave. Because of this not all the earth had been put back into the grave at the time of the burial, so it seems likely that a small burial mound or barrow surmounted the grave. 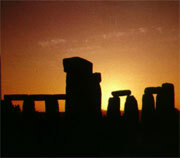 The site of Stonehenge at sunrise. The radiocarbon dates show that the Archer lived between 2,400 and 2,200 years BC. The burial lies about 5km (2 miles) south-east of Stonehenge and it was at about this time that the massive stone circles, and the avenue leading to the River Avon from the site, were built. 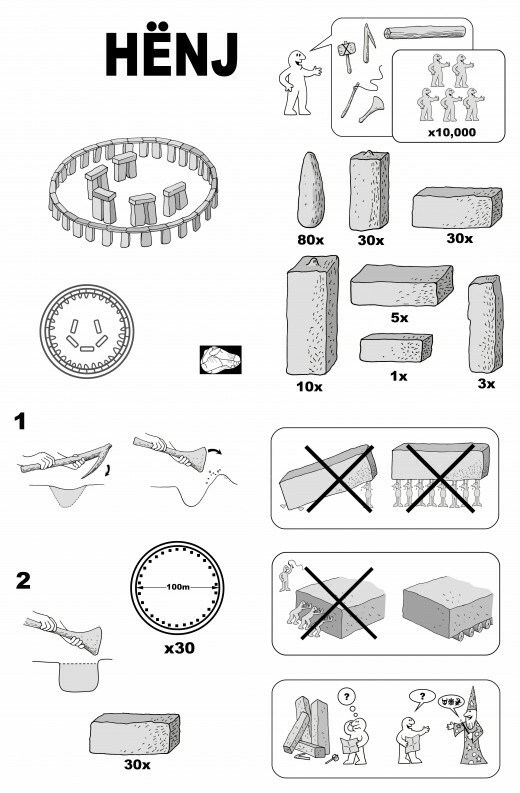 The great temples of Woodhenge and Durrington Walls, both a similar distance away, continued to be used and modified throughout this time.In the past, burials of this date were considered rich if they contained more than a handful of objects, especially if one of the objects was of copper or bronze, or even gold. Although the finds buried with the Archer are all of well known types (within the Beaker cultural package that is found across much of central and western Europe at this time), the number of objects found with him, almost 100, is without compare. Had these two men been part of a ruling élite? The burial is also one of the earliest of its type in Britain, some of the finds are of the highest quality, and the gold is the earliest yet found in Britain. 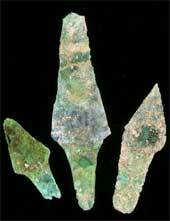 Furthermore the copper knives came from Spain and western France – an indication of the wide contacts of their owner. Above all, though, the associations between these finds are of particular importance. Can it be a coincidence that the richest Early Bronze Age burial in Britain, and its companion, should be so close to the great temples of Durrington Walls? Had these two men been part of a ruling elite? Had one of them been a king? The Archer’s copper knives As the archaeologists discussed these questions, further surprising facts became clear. Some archaeologists have argued that, for the period in question, there is no certain evidence for the sort of social differences that might suggest a ranked society. The discovery of the burial of the Amesbury Archer and his companion, however, showed for the first time that at this date there were individuals – and perhaps even families – of greater wealth and status than others. That this elite had ties across Europe is shown by the sensational discovery that the Archer comes from central Europe.The enamel on our teeth stores a chemical record of the environment where we have grown up. It is possible by using Oxygen Isotope Analysis to measure this record. The Archer’s teeth show that as a child he lived in a colder climate than that of Britain today, in central Europe, and perhaps close to the Alps. He was raised in central Europe but he died near to one of the greatest temples in Europe. Much work remains to be done. 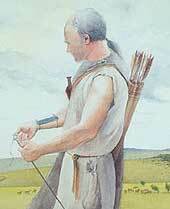 At the moment we do not know why the Amesbury Archer came to live, and perhaps raise a family, near Stonehenge. Was he brought up in the family of distant allies? Did he arrive in order to seal an alliance by taking a partner? Was he a settler or a pilgrim? Or was he an outsider with the magical skills of alchemy? We will never know all the answers, but we can say this. He was a strong man, who overcame pain and handicap. He could work new and exotic metals. His mourners gave him the richest burial of his time. He was raised in central Europe but he died near to one of the greatest temples in Europe. We may not know if he was a king, but it is still an astonishing story. It is a Bronze Age biography.